In measuring circuits at microwave frequencies, it is essential to have a known reference plane, particularly when measuring transistors whose characteristics are affected simultaneously by input and output impedances. Various calibration techniques are used to measure devices at microwave frequencies. One of those techniques using standards of a “thru” line, “reflect”—typically an open circuit, and a second line, or multiple lines, each longer than the “thru” line. Measurements can be taken over a frequency range correlated to the difference in electrical length between the “thru” and the “line” standard, or standards.These TRL standards allow direct de-embedding of measurements up to the edge of a standard transition which is half of the “thru” connection (See Reference 1). For probe measurements of transistors, a typical launch structure smoothly transitions the coplanar ground-signal-ground (GSG) probes to microstrip connections at the transistor. Many probe calibration methods yield a measurement reference plane at the point of contact of the GSG probes. The TRL method allows for moving the reference plane to the edge of the gate and drain connections of standard transistor layout, as shown in figure 1. Figure 1 • Reference Planes of Measured HEMTs. Another advantage of including TRL calibration structures with an IC fabrication is that some process variation can be compensated for when de-embedding the common “half thru” launch. If the line impedance of the transition changes due to changes in the substrate thickness, or, over or under-etching of line widths on a PC board, these variations will be de-embedded leaving the reference plane at the transistor edges as desired. In this example, on chip TRL calibration structures were not available, so an EM simulation of the physical layout of the “half thru” launch is used to de-embed the transistor measurements. If variation in substrate thickness did occur, and was known, it could be included in this “virtual TRL calibration” de-embedding method. 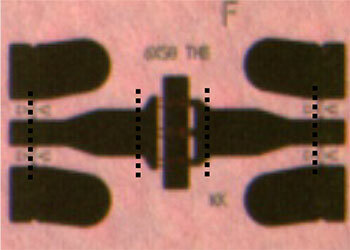 A lack of a TRL calibration kit does not negate the use of a physical structure to de-embed the common GSG to microstrip transition. In this case, the nominal physical description of the transition is known and can be simulated with an Electromagnetic (EM) Simulator such as Sonnet EM, Keysight’s Momentum, or AWR’s Axiem simulator. Simulations of a similar GSG launch yield reasonably close agreement among these three EM simulators, though only the Axiem EM structure is shown here (figure 2). A key requirement of the 2.5D EM simulator is the ability to solve a three connection GSG coplanar port defined internal to the pads where the probe pins make contact. Each port has the signal designated as “1”, or “2”, while the differential (ground) contacts are “-1” and “-2”. While figure 2 shows the physical layout of an entire “thru” standard, a separate EM simulation was performed on half of this structure to de-embed the common coplanar to microstrip launch. This “half thru” can then be easily de-embedded from s-parameter measurements of the desired transistors, or other circuits. De-embedding load pull measurements uses the same concept but requires additional effort, as described later. Figure 2 • 570um Thru Line—2D and 3D view of Axiem EM Simulation Structure. Figure 3 shows the schematic in Microwave Office (MWO) for subtracting the Axiem EM simulated GSG launch to de-embed the measured HEMT s-parameter data up to the gate and drain connections. 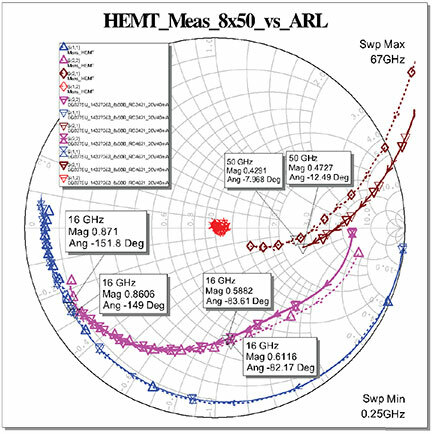 A Smith Chart plot of the de-embedded measured data (up to 67 GHz) compared to vendor supplied data (up to 50 GHz) at the HEMT connections shows good comparison (figure 4). The DC biases were similar, but different, and while the HEMT device was from the same wafer lot, it was likely a different device too. Figure 5 shows the magnitude of s11, S22, and S21 of the two sets of measurements as a rectangular plot. Figure 3 • Schematic for De-embedding GSG Launch from Measured HEMTs. Load pull measurements were performed on HEMTs at various frequencies. These also required a shift in the reference plane using a similar method to de-embed the electrical length of the GSG launches.Microwave Office was used to plot the load pull contours. There did not appear to be a convenient mechanism to shift the contours in a method similar to the one used for the s-parameter measurements. Figure 4 • Measured and De-embedded 8x50um HEMT (0-67GHz) vs. Vendor (0-50GHz). 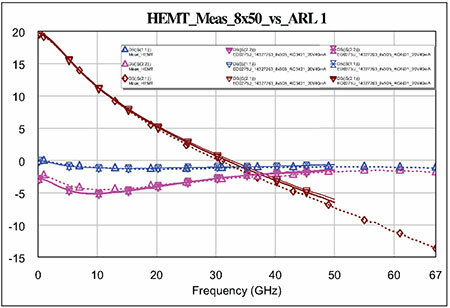 Figure 5 • Measured and De-embedded 8x50um HEMT (0-67GHz) vs. Vendor (0-50GHz). After trying tedious methods to de-embed the measured impedances and transform a few load pull files, a simple perl script was created to easily process the load pull files. The script reads in the measured impedances (Gamma_dut) and rotates them by approximately twice the electrical length, as determined by the EM simulation of the GSG launch. Conversions are made between the real and imaginary reflection coefficient for each load pull data point, converts to magnitude and angle, rotates to de-embed the GSG launch, then converts back to a final real and imaginary reflection coefficient. A sample plot of load pull contours measured at the GSG probe pads at 16 GHz is shown in figure 6, and the reference plane shift corresponding to the drain connection of the HEMT is shown in figure 7. 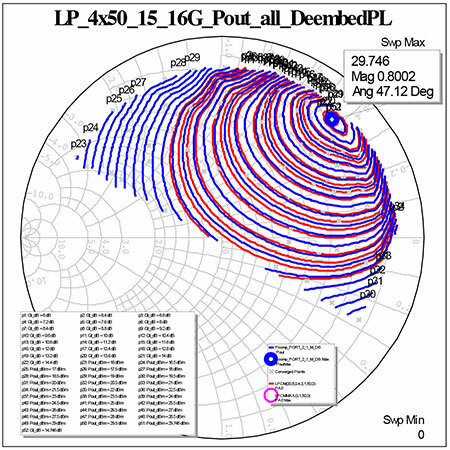 The de-embedded plot shows a smooth virtually identical set of contours with the reference plane shifted to the drain connection of the HEMT. 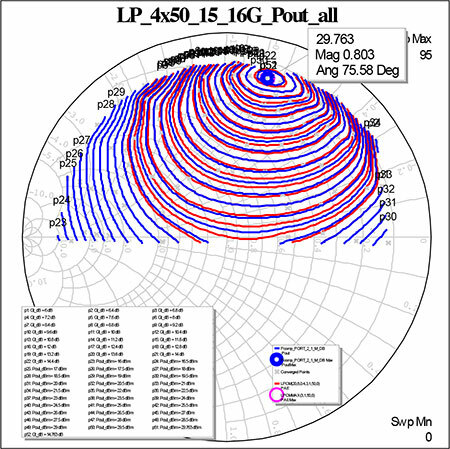 Figure 6 • Load Pull Contours 4x50 HEMT at 16GHz (Power-blue, Efficiency-red). Figure 7 • Load Pull DeEmbed 4x50 HEMT at 16 GHz (Power-blue, Efficiency-red). Using an EM simulation of the GSG launch to de-embed, or shift the reference plane, of s-parameter data appears to be a useful substitute when an actual TRL calibration kit is not available. This technique works well for measured load pull data as well. One could easily extend this idea to de-embed a network, eg matching network, using the full 2 port s-parameters. This example using a nearly lossless GSG launch results in a simple rotation of the reference plane. A simple Perl script was created to read in a Maury load pull, or source pull, file and translate the impedances to the device gate or drain connection. Matlab2007 was used to run the perl script to process these load pull files. It is very important to maintain the exact formatting of the file, in order for it to plot successfully in MWO. Each load pull reflection coefficient is converted from real and imaginary to a magnitude and angle, then rotated by the twice the angle of the GSG launch ($angle), then adjusted in magnitude to compensate for the virtually lossless GSG launch (1/$magn), then converted back to real and imaginary for the de-embedded impedance, and finally, written to the output. This file could be re-written to take the magnitude and angle of the GSG launch as an input parameter, but for this example it is included in the script and needs to be modified at each frequency (eg 8, 16, 24, … GHz), as well as adjusted for the appropriate GSG launch. Following is an example of a typical Maury load pull file referenced to the probe pads, followed by its output from this perl script to create the de-embedded load pull file referenced to the drain of the HEMT. Each line that starts with “Gamma_dut” is the impedance of a given tuner measurement as a real and imaginary reflection coefficient. That impedance is modified to reflect the shift in the reference plane, otherwise the rest of the file is identical. Measuring unmatched transistors requires precise calibration of the reference plane in order to use these measurements in designing circuits, especially at higher frequencies. A TRL calibration kit is a useful way to de-embed a standard launch structure. For this example of a HEMT in an MMIC process, a TRL calibration kit was not available. 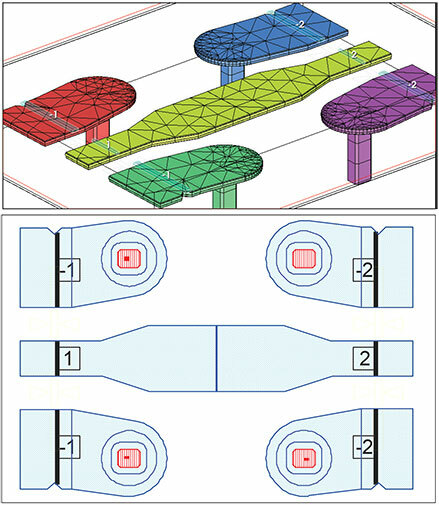 However, the physical layout of the common coplanar GSG to microstrip connection was utilized in a 2.5D EM simulation (Axiem). The use of the EM simulation as a virtual TRL calibration kit to translate the reference plane of the measured HEMTs to the standard gate and drain connections was quite successful, as shown in these measurements up to 67 GHz. A simple perl script was written to perform an adjustment of the reference plane to load pull measurements. An example of that perl script to adjust a load pull, or source pull, file at a single frequency is included. The results of the Axiem EM (AWR) simulation of the physical coplanar to microstrip launch were successfully used to perform the equivalent function of a TRL calibration kit, to de-embed up to the transistor connections. John E. Penn received a B.E.E. from the Georgia Institute of Technology in 1980, an M.S. (EE) from Johns Hopkins University (JHU) in 1982, and a second M.S. (CS) from JHU in 1988. Since 1989, he has been a part-time professor at Johns Hopkins University where he teaches RF & Microwaves I & II, MMIC Design, and RFIC Design. Email: jpenn3@jhu.edu.